If you're serving anything that needs to be cut while holding a paper plate with one hand (a lot of the best 4th of July foods), hopefully you picked up a few KNORKS for your guests. What's a Knork, you say? Well, obviously you've missed the spots on Rachael Ray and Food Network's Unwrapped. It's basically a fork and knife combined into one. The tines are curved and beveled, but not sharp enough to cut your mouth. 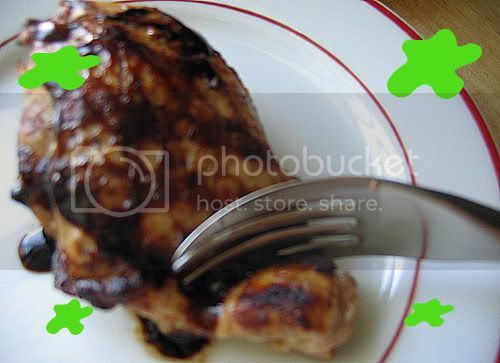 I tested it out on a chicken breast (drizzled with Rachael Ray's Balsamic Drizzle, but that's another post). It cut through pretty well. The "finger platform" (you can't see it in the pic, sorry) does actually help you press into the food more than a regular fork for improved cutting. The Knork also comes in a plastic version, which I tested out on pizza from Whole Foods. While similar in shape, the plastic knork was harder to stabilize, and it's cutting action didn't seem all that better than a regular fork—even when cutting through thin crust pizza. So, for the novelty factor, I think Knorks are pretty useful and fun. While you probably won't ever see them at your finest steakhouse, they're certainly a conversation starter. Maybe leave one out for your next blind date to use and watch the conversation take off! Thanks to the Knork people (Knorkees?) for sending me a few to test out! Have a most excellent 4th yourself! You're my favorite new blog! I have used a spork before but not a knork. Have a great 4th Jacob! Still home...way too much fog here in San Francisco..I miss the hot summers in Chicago. 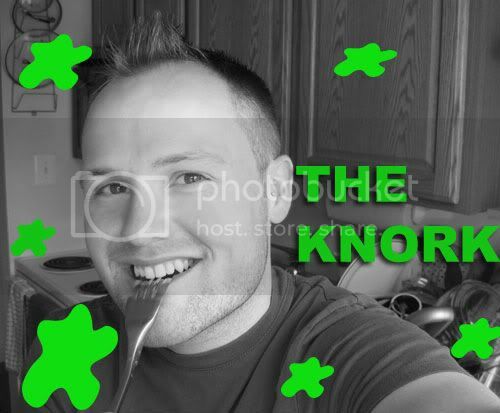 I have a spork and a foon, but this is the first I've heard of a knork. Have to check this out. I own ONLY Knorks, no forks. They are amazing. Try them, you'll never go back!! They are hard to find so you'll probably have to go to their website- that's what I do. I think it's knork.net.